Two of Australia’s most loved brands have come together to create the ultimate in exterior roofing coordination – Colorbond Roofing, guttering and Dulux Weathershield. This innovative partnership has sparked a whole new fresh trend in roofing, fascia boards that precisely match either the Colorbond roofing or guttering. What this means for our Strong Life roofing replacements. It doesn’t matter if it’s a room, a painting, or the exterior of a house – most people instinctively prefer uncluttered, housing décor. Having fascia boards painted with pre-tinted Dulux Weathershield which accurately harmonises with Colorbond roofing or guttering, generates ‘colour blocked’ areas of roofing, which leaves space for other eye-drawing features. Not only do precisely coordinated Colorbond roofing, guttering, and fascia boards increase curb appeal for most roofing replacements, but they can breathe new life into nearly every style of renovated property. Colour blocked roofing works particularly well for heritage style renovations. One problem many heritage home renovators experience is having their property’s two-toned colour scheme spoiled by fascia paint that dries one or two shades lighter, darker or even a totally different pigment. 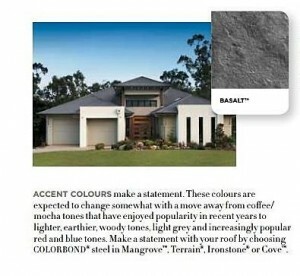 No longer is the two toned colour scheme dependent on how closely mixed and matched the fascia board paint is. Colourbond roofing and guttering, and Dulux have taken extreme care to match their products as closely as possible. Even retro housing roof replacements can benefit from roofing, guttering and fascia board coordination. The underlying design principle is the same, if you colour blocked roofing and fascia boards, your home’s entrance can be used for other more attractive, eye-drawing features. If you are looking for exceptional Tile and Colorbond Roofing Restoration and Replacements, take advantage of Strong Life Roof and Guttering’s 18 months interest free finance, our senior’s discount, or our obligation free inspection.